Preheat oven to 220°C (425°F). Place the rock salt on a baking tray and top with the potatoes. Prick the potatoes all over with a metal skewer and roast for 1 hour or until soft. Allow to cool slightly. Cut the potatoes in half and scoop the flesh into a medium bowl, discarding the skins, and set aside. While the potato is cooling, place half the milk in a small saucepan over high heat and bring to just below the boil. Remove from the heat, add the butter and sugar and stir until the butter is melted. Add the yeast and the remaining milk and stir to combine. Set aside in a warm place for 5 minutes or until the surface is foamy. Place the flour, sea salt, eggs and the yeast mixture in the bowl of an electric mixer fitted with a dough hook and beat for 5 minutes or until the dough is smooth and elastic. Place the dough in a lightly oiled bowl, cover with plastic wrap and set aside in a warm place for 30 minutes or until doubled in size. Sprinkle the dough with the potato and gently knead to combine. Divide the dough into roughly 34 x 1-tablespoon portions and roll into balls. Line a 24cm round cake tin with non-stick baking paper, allowing 3cm of the paper to sit above the edge. Lightly grease an 8cm-tall x 8cm-wide ovenproof ramekin+ and position it in the centre of the tin. Place the parsley, rosemary, thyme and oil in a small bowl and mix to combine. Roll the dough balls in the herb mixture and place in the tin. Cover with plastic wrap and set aside in a warm place for 30 minutes or until risen. + It’s important the ramekin is at least 8cm tall, as the dough will continue to rise as it bakes. 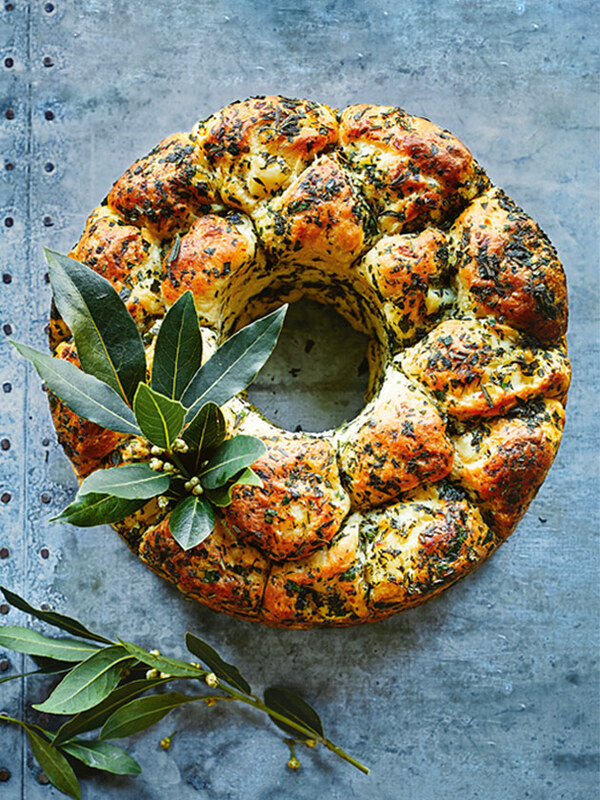 Tips: A sprig or two of fresh bay leaves or rosemary, pushed into the baked bread, makes a lovely addition to the wreath. Place it in the centre of the table for easy sharing and it will double as a festive centrepiece.